We use a variety of computational modelling techniques to describe neural activity in different parts of the brain and animal behaviour. This includes numerical simulations of single neuron and network activity. We closely collaborate with experimental research groups to combine experimental data with computational models, e.g. by using recorded neural activity as realistic models inputs and to test model predictions. Learn more about the computational models used in our research here. Animals constantly need to select and execute actions in order to ensure their survival (finding food, shelter, etc.). In addition, many parts of the brain are also busy with preventing animals from doing actions which might be harmful for them. The basal ganglia have been implicated in the selection and execution of actions, but also in the quick suppression of potentially harmful actions. 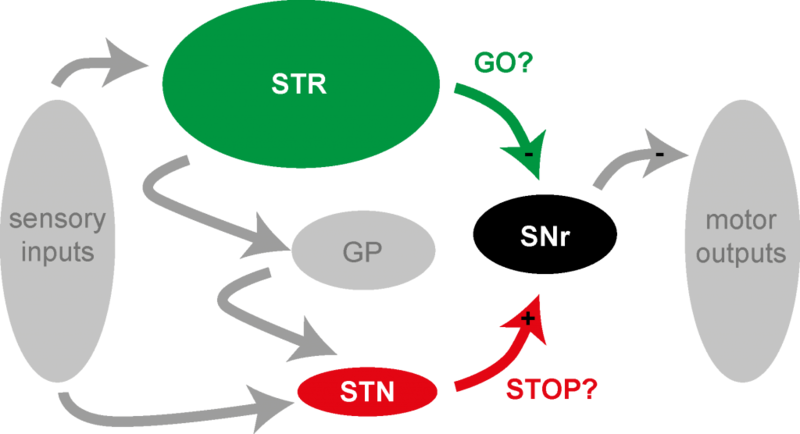 Within the basal ganglia different pathways have been proposed to promote or suppress actions, respectively. Learn more about our ongoing research on inhibitory control here. Dopamine is a neurotransmitter with complex, not well-understood effects. In the basal ganglia dopamine modulates cortical input to the striatum. We study the functional role of dopamine with computational models ranging from `low-level’ cellular models, over neural network models to `high-level’ reinforcement learning models. The goal is to understand how dopamine contributions to learn selecting good action (e.g. via synaptic plasticity) as well as the actual execution of actions (e.g. by changing motivational aspects of behavior). We apply our research result to clinical scenarios including Parkinson’s disease to study how pathological dopamine levels affect behavior. Learn more about our ongoing research on dopamine here. While, beta oscillations are prominent in patients with Parkinson’s disease, they also occur in healthy animals. One circuit where beta oscillations can be generated includes the globus pallidus and the subthalamic nucleus. We study the neural mechanisms that lead to beta oscillations and also potential functions that beta oscillations have in the processing of information. In previous work we have found that beta oscillations occur when sensory cues are utilized for behavior (Leventhal et al., 2012), suggesting a functional role of beta oscillations in sensorimotor processing. To further specify function and mechanisms of beta oscillations, we generate large-scale network simulations of basal ganglia circuits in healthy and pathological scenarios (Mirzaei et al., 2017). Learn more about our ongoing research on beta oscillations here.